History has historically speaking (every pun intended) been my very least favorite subject. so, allow me to share a few timeline Throwback Tales and Flashback Facts for a trending update. 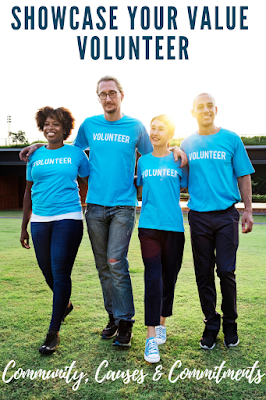 As an educator, education and entertainment go hand-in-hand for the majority of our family experiences. 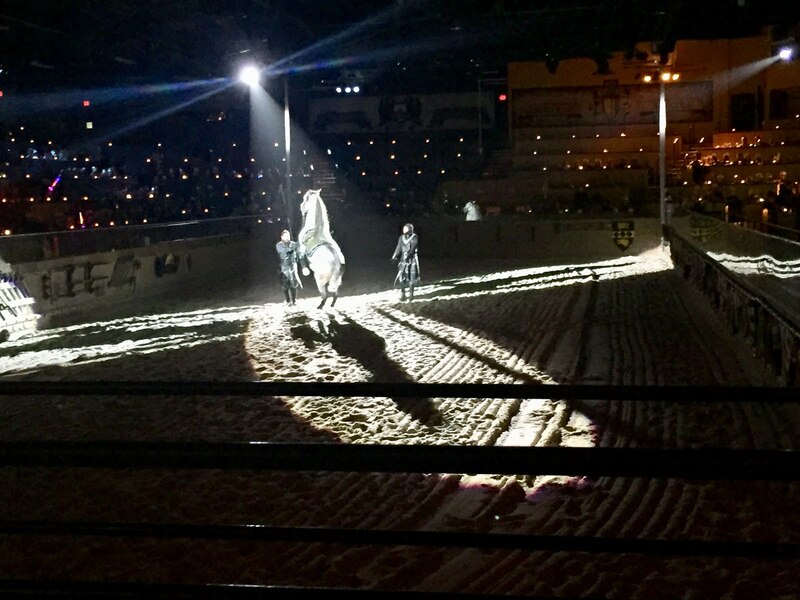 We've been captivated by many thrilling adventures at Medieval Times Dinner and Tournament performances in New Jersey and the flagship location, Florida (where it all began- for Medieval Times, the #1 dinner attraction in the US). History buffs and fearless funseekers, like myself will delight in an experience based upon authentic Medieval history brought to life recreating the true story of a noble family with documented to be dated back to the 11th Century. According to modern day calculations, more than an estimated 60 million royal guests have experienced the majesty of Medieval Times castles. 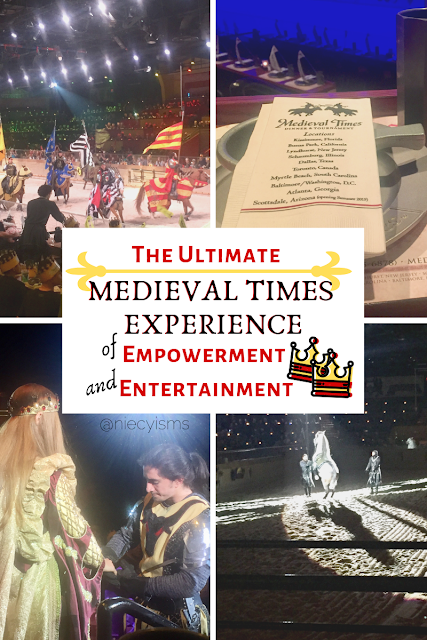 Prepare to witness the ultimate Medieval Times experience of empowerment and entertainment. Thank you to Medieval Times Dinner and Tournament and their Lyndhurst, NJ promotional team for extending the royal invitation from Queen Isabella to visit Medieval Times as a Royal Blogger contributor. Beneath the watchful gaze of the Queen, the best of the best Knights will enter the Royal Realm. Which Knight will cheer on to stand as the undefeated champion? The Black & White Knight - In prayer, humble. In service, loyal. In battle, invincible! The Green Knight - Unquestioned master of weapons with a temper known as the dragon’s claw. The Yellow Knight - Well-versed in the arts of chivalry, yet in attack, he is the lion uncaged! The Red Knight - Called the “lion’s heart” in many a battle. Set him at liberty, and paralyze the enemy! The Red & Yellow Knight - Defeat and regret are the reward of challengers to the point of the Red & Yellow Knight’s lance! The Blue Knight - Renowned as a champion of the defenseless! Did you know that royal red dye was taken from a Mediterranean insect with a bright scarlet color, green dye came from lichen, and the Dyerswoad plant creates blue dye? Massive Medieval castles were designed to be difficult to attack and easy to defend. Upon your arrival, marvel at the splendid details of the Medieval Times castle, styled as a powerful status symbol of wealth and power. 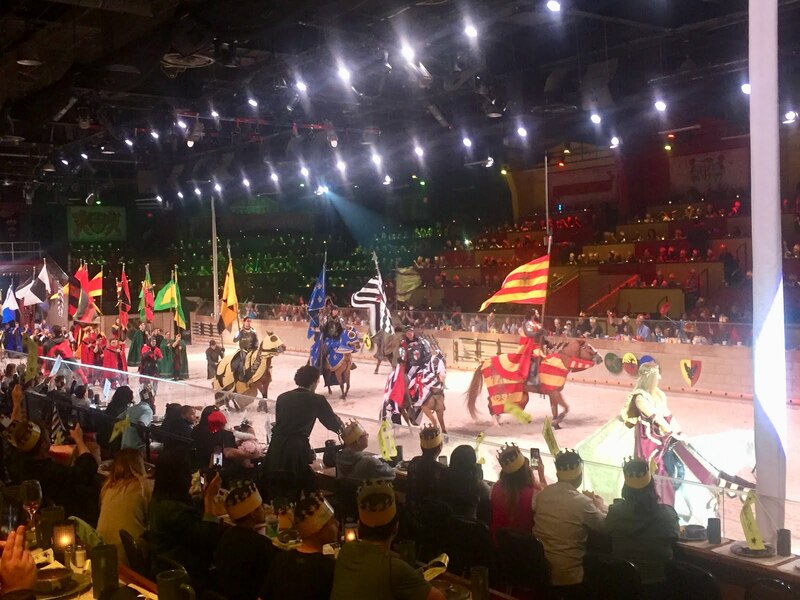 Entertaining royal guests, cheer triumphantly for your knight during a 2-hour medieval jousting tournament featuring six daring knights, Medieval weaponry, stunning horses, and a majestic flight of the castle's royal falcon. Did you know that castles from Medieval times and later were traditionally constructed of rocks and stones, built upon higher ground, and often surrounded by water, known as a moat? 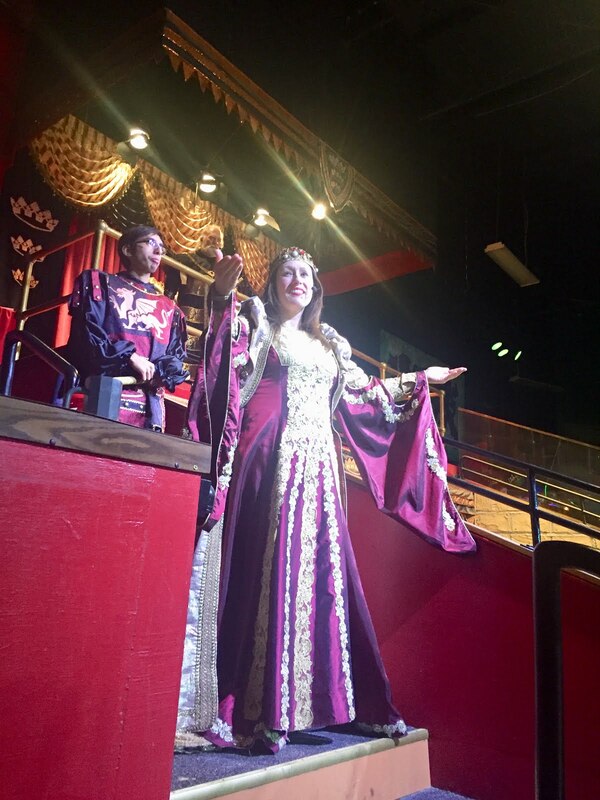 Prepare to dine like Medieval royalty as Queen Maria Isabella welcomes you to partake of a four-course feast with herself and her royal court. 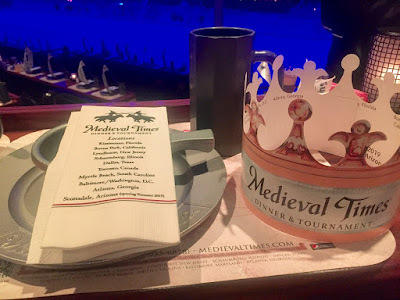 Seated within the realm of the Medieval Times castle, noble guests enjoy a magnificent meal presented medieval-style, without silverware, featuring garlic bread, tomato bisque soup, roasted chicken, sweet buttered corn, herb-basted potatoes, dessert, coffee, two rounds of select beverages, with additional libation and spirits available for purchase. Select feast accommodations for dietary concerns, such as vegetarian meals, are available upon request. Did you know that honey, herbs, nuts, roots and flowers were eaten and used in medicinal tonics and teas during Medieval times? Entering the realm of Medieval Times, recreates the lively atmosphere of the center of a Medieval village where citizens lived, worked, socialized, enjoyed local festivals, worshipped, and celebrated life's special moments. Visiting Medieval Times to celebrate birthday parties, graduations, holiday parties, family reunions, military events, religious events, anniversary parties and dinners, homecoming, prom, baby showers, quinceañeras, promotions, and retirement parties and many other occasions becomes a noble event. Royal gatherings such as corporate events, scout meetings, school and summer camp visits become epic memories. 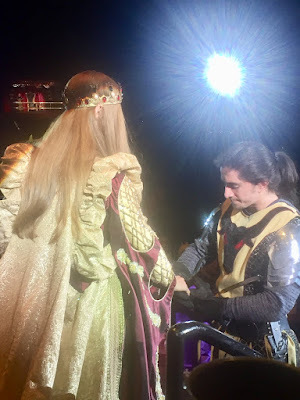 Did you know that Medieval dramatic presentations were performed with elaborate costumes and traditional musical instruments were performed outside of churches and in marketplaces? Did you know that there's a student program at Medieval Times Dinner & Tournament to enhance academic programs with a educational, entertaining curriculum materials to supplement medieval studies? Your ultimate Medieval Times experience awaits!